Strut your Mutt at the Georgia SPCA (Society for the Prevention of Cruelty to Animals) 3rd Annual Run for the Rescues 5K, Fun Run and Festival. This event will take place in the beautiful Suwanee Town Center Park in the Heart of Suwanee. 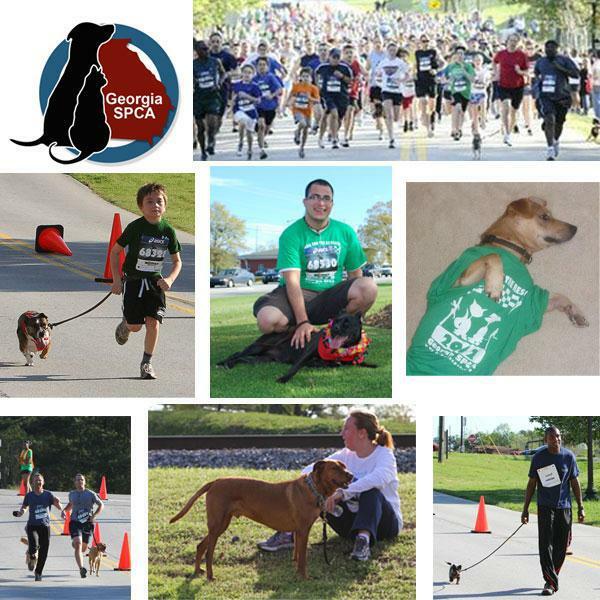 We encourage everyone to bring their dogs for this run to benefit homeless pets. In addition to the race, there will be a Festival at the Suwanee Town Center from 8:00 am to 4:00 pm. Enjoy food and beverage, arts and crafts, inflatables for the kids and treats for dogs, cats and runners alike. Vendors of all kinds will have samples and products for sale. The Gwinnett PD is presenting a demonstration with a K-9 unit, and Smart Critters is doing an agility/frisbee demo. Many local rescues will be there with dogs for adoption. Enjoy demonstrations and pet contests - biggest, smallest, pet trick etc. Win prizes throughout the day. There's something for everyone at this fun event! After the race, stick around for the festival with awards, prizes, food, beverage, lots and lots of vendors and much more! Online - www.active.com - go here. We need lots of volunteers! Click the link for the area where you'd like to help and sign up online. Volunteers will receive free breakfast and a volunteer t-shirt. Please enter your t-shirt size in the "comment" field when you sign up.